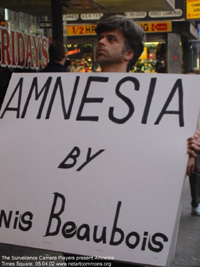 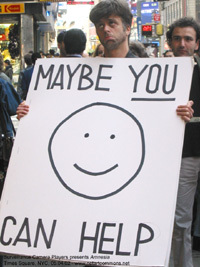 A little after 3:00 pm (EST), Bill Brown of The Surveillance Camera Players stepped in front of his favorite webcam on Times Square to perform Amnesia, an adaptation-homage Denis Beaubois's pioneering 1996 "surveillance theater" piece In the Event of Amnesia the City Will Recall. 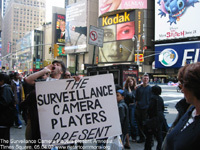 To view photos of the performance, which premiered as part of Open_Source_Art_Hack, read more. 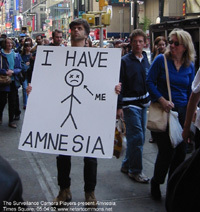 Video documentation of the performance will be on view in the New Museum's Window on Broadway throughout the course of the exhibition. 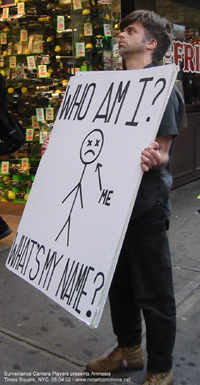 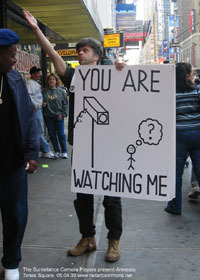 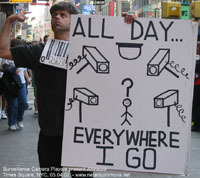 For further information about The Surveillance Camera Players: http://www.notbored.org/the-scp.html.